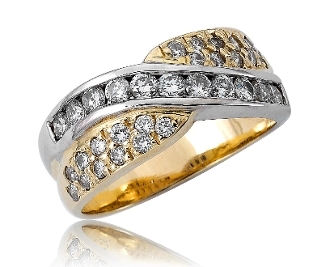 Be apart from the rest with this gorgeous two-tone crossover Diamond ring. It showcases 1.21 Carat t.w. brilliant round cut Diamonds channel set through white gold waving over two rows of pave set Diamonds in yellow gold. With G-H color grade and VS2-SI1 clarity, these Diamonds sparkle endlessly. Masterfully crafted using 14 Karat gold, this fabulous museum quality piece of jewelry is a treasure to have! For added appeal choose to have Engraved, please select size when adding to Cart.